Ryanair is changing. It is even trying to be nice to customers. But Europe’s largest low-cost airline still holds fast to one old habit – giving excessively conservative guidance to investors. But its strategic restart is likely to take off faster than the group’s cautious outlook on its new financial year suggests. After an 8 percent drop in last year’s net profit, the midpoint of the new guidance implies a rise to a level merely five percent above 2012 results. It’s an easy target, considering the multi-faceted campaign to move the brand upmarket. Rival easyJet has shown that relatively small tweaks can have large effects on demand, fares and profit. Ryanair is copying some of easyJet’s tricks: allocated seating, more desirable airports and lower charges for carry-on luggage. If anything, Ryanair will gain more, since it has further to go. For example, a tacky and unwieldy website used to be a huge competitive burden. The reduction in the number of clicks needed to book a ticket – from 17 to five – will turn off fewer customers. The airline has also released its winter schedule three months earlier, driving up advance bookings by up to 7 percent. This lowers uncertainty and reduces the number of unsold seats shortly before the flight date, driving up prices for last-minute bookings. Allocated seating speeds boarding and, as easyJet has found, increases revenue from passengers who are willing to pay a few euros extra for being able to chose their particular seat. New connections to main airports, including Rome’s Fiumicino, make the airline more attractive for business customers, basically a new market for Ryanair. The airline’s inclusion of electronic distribution systems used by professional travel agents, new in April, will also help. Of course, there are risks, including a fragile economic background, intense competition and a lingering row over pilots’ pay and working conditions. But Ryanair has done many things right over the last six months. It should be able to reap the benefits soon. Investors are already on board with that. They price the company at 14 times expected earnings, according to Starmine. For shareholders, Ryanair is still Europe’s most expensive airline. 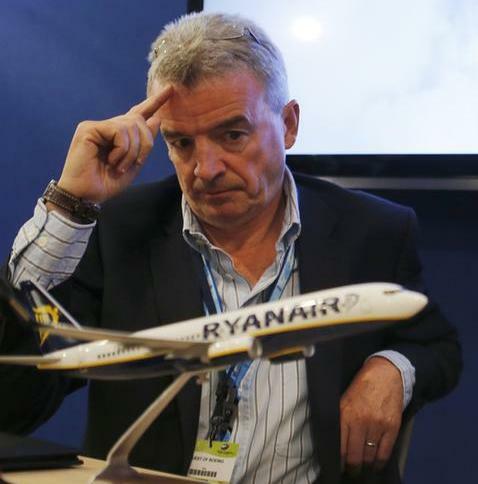 Ryanair Chief Executive Michael O'Leary attends a signing ceremony at the 50th Paris Air Show. Shares in Ryanair rose 9 percent on May 19 after the airline announced net profit in the 2013/14 fiscal year that was slightly above its expectations. The Dublin based carrier, which had guided for after-tax profit of 500 to 520 million euros, earned 523 million in its fiscal year that ended in March 2014. The airline reiterated plans to return 500 million euros to shareholders this year. It said it expects to fly 84.6 million passengers in the coming fiscal year, four percent more than in the previous one. After-tax profit is guided to be between 580 and 620 million euros.